We’re proud of our outdoors heritage, but the great outdoors isn’t all about sharing the untamed wilderness with ticks, chiggers and the wildlife. Sometimes, a leisurely day outside calls for a little more refined recreation. If you’re looking to hit the links, look no further than the Oneida Municipal Golf Course. The Oneida Municipal Golf Course is a city-owned, city-operated 9-hole golf course in the Town of Oneida. Originally opened in 1967, the golf course — located at Ponderosa Estates — was privately owned and operated until the town purchased the course from a group of businessmen in 2007 to prevent it from being developed. 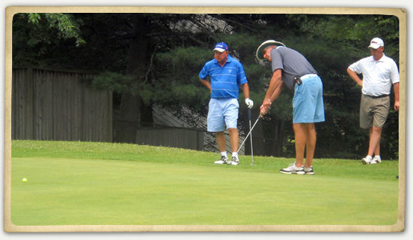 The course is an asset to the community, hosting the local high school golf team’s events as well as an annual fund-raising event for the Boys & Girls Club of Scott County. The course is located at 1180 South Lake Drive in Oneida. Call (423) 569-9506 for tee reservations or more information.